industries, though, are not prepared to take advantage of it. For those books on mobile and iPhone/iPad design and development, they do not take into consideration the unique aspects of the enterprise environment. 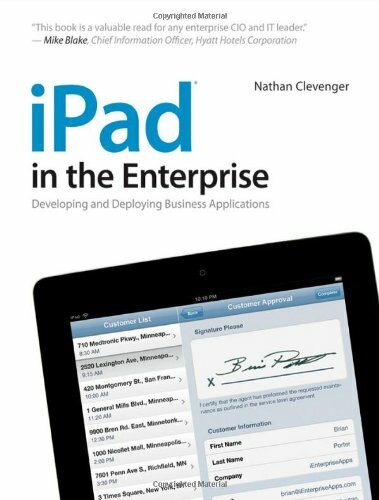 iPad in the Enterprise is a guide for developers and IT who are tasked with planning, designing, developing, deploying, and supporting iPad applications used in the enterprise. The book features: Considerations for both business and IT for taking advantage of the iPad and achieve dramatic ROI Architectures for enterprise iPad applications and data integration with existing systems User interface design and user experience prototyping tools and techniques Criteria for evaluating and selecting the best option for software development Enterprise-friendly approaches to provisioning, security, and device management Case studies of thought-leading organizations that have empowered their workforce with iPads Companion worksheets, user interface paper prototyping templates, sample code, and various other resources will be shared on the book's web site.#xA0;Additionally, as this book is all about using the iPad to maximize enterprise productivity, several iPad apps will accompany the book that include worksheets, working sample apps, training instructor guides, resources. Nathan Clevenger has been developing mobile software for over 12 years. In addition to his role as Enterprise Editor for iPhone Life magazine, he leads the Mobility Practice at ITR Group, a management and IT consulting firm, where he works with FORTUNE 500 clients to develop strategies and enterprise architectures for mobile line-of-business solutions. He regularly speaks at industry events around the country, and is extremely passionate about the unrealized potential for mobile technology like the iPad within the enterprise.